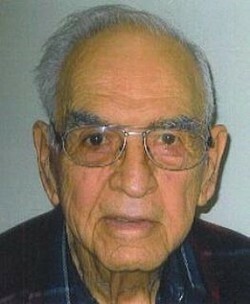 Austin Stanley Allen was born on June 12, 1917 at home in Wyoming Township, to Austin and Emma (Hershberger) Allen. He graduated from the Wyoming High School in 1935. He married Erma L. Rohwedder on April 8, 1939 in Cresco, Iowa. They celebrated 63 years together before Erma died on July 10, 2002. He was a lifelong farmer with his wife, Erma. They farmed in the Wyoming and Olin areas. He was a member of the Olin United Methodist Church and the Jones County Farm Bureau. His hobbies and interests were his family, fishing and gardening. He is survived by three grandchildren, Matthew (Doreen) Allen, of Olin, Molly Allen and Mindy (Dave) Moore, both of Cedar Rapids; One great-granddaughter, Abigail Moore, three step-great-grandchildren, David, Kenna & Robin, and several nieces and nephews. He was preceded in death by his parents, Austin and Emma Allen, his wife, Erma Allen, one son, Thomas Allen, a daughter-in-law, Julianne (Cashman) Allen, four brothers, John, Theodore, Jacob and Robert Allen, and two sisters, Leah Davis and Verna Mais. Austin Stanley Allen of Olin, Iowa, died Sunday, June 24, 2007, at Silvercrest of Anamosa, Iowa, following a lengthy illness, at the age of 90 years.